Using a C Corporation to income average as compared to an S corporation. A C corporation can be used for income averaging. Let’s talk about the concept of using a C corporation to income average. The example below give you an idea of the tax savings available. Three things to keep in mind. 1. The C corporation will get the tax back via a refund when the NOL is carried back, but, of course there is a cash flow issue. During the period the IRS has the tax money pending the NOL carryback, there is a cost of money. In our example below, the federal corporate taxes on $160,000 is $45,650. So this money would be unavailable to the Taxpayer for a year. At 10% interest the cost of funds would be $4,565. So there is still an overall savings. 2. The example below is just for 2 years. Keep in mind that the NOL can be carried back 2 years. So you could have a loss in Year 3, and carry back the NOL to Years 1 and 2. This would allow for even more income averaging. 3. 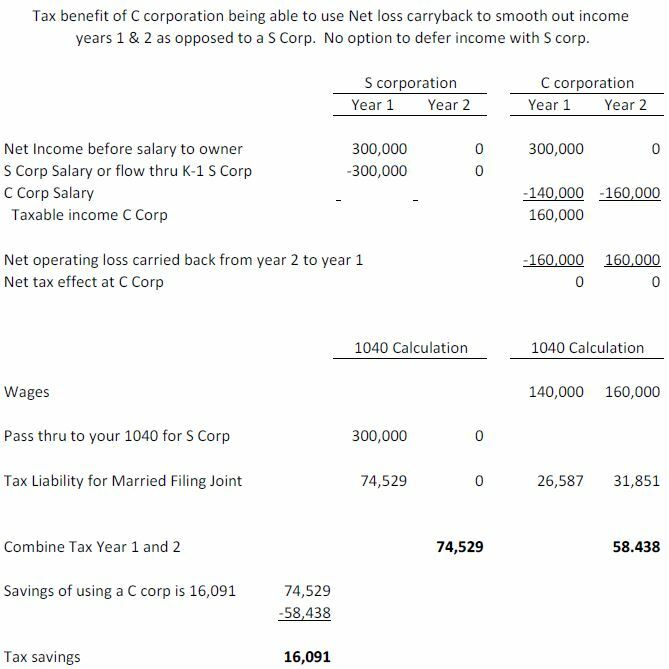 Also the pension benefit allowed would be greater with the C corp example. Let’s say the S corp had a SEP retirement plan that allows for 25% of salary. So you might assume you could make a $75,000 contribution ($300,000 X .25%). But the limit per year in 2016 is $53,000 ($59,000 if 50 years of age or over). So, the SEP contribution is limited. Not so with the C corporation example below because the salary is spread over two years. You get to contribute money and enjoy the tax savings on the additional contribution. The additional SEP contribution would be $22,000 ($75,000 – $53,000), and you get a tax deduction on the $22,000 at 39% or $8,580. 4. So in our example, there is a $16,091 tax benefit less the cost of money of $4,565, plus the tax savings on the ability to make an additional SEP contribution of $8,580 for a total savings of $20,106. See the example of the benefits of using a C corporation to income average.